Pick and complete 5 of the following 6 questions. You may work in groups of up to three people. a. Go through the exhibits and find the European glass lizard, the greater siren (an amphibian), and a snake of your choosing. What do all three have in common in terms of body plan/layout? What advantages does this adaptation bring with it? b. These species are distantly related. However, they each have similar body plans. This is known as analogous structures. Based on your observations, what do you think the term means? b. These snakes no longer use their hips for movement. These hips are therefore known as vestigial structures. From your observations, what do you think this term means? a. Go through the exhibits and find the exhibit for the leopard tortoise and snake-neck turtles. (They’re next to one another.) Examine the feet of each reptile. How is each adapted to its means of locomotion? b. These reptiles once had a common ancestor, but have diverged based on their environments and natural selection. Their feet are homologous structures. From your observation, what do you think the term means? a. Go to the exhibit displaying the emerald tree boa (this may be labeled emerald boa) and green tree python. Describe what each looks like and the way in which they are sitting. Are there similarities in the way each looks/behaves? b. Look at where each snake is found on earth. Where does each live, in terms of geography? c. Look at the environment each has in its enclosure. Describe each. Are they similar/different? d. The emerald boa and green tree python are distantly related species. However, they an example of convergent evolution. Based on your observations, what do you think the term means? a. Go through the exhibits and find the radiated tortoise. Note what it looks like and where it can be found geographically. b. Go through the exhibits and find the leopard tortoise. Note what it looks like and where it can be found geographically. c. These species are likely descended from a common ancestor, but speciated because of a geographic barrier between them. From your observations, what do you think this term means? a. Go to the exhibit about the milk snake. Describe what it looks like. b. Look at the information about the coral snake. (It’s on the panel in front of the milk snake exhibit.) Milk snakes’ predators are mostly birds of prey (hawks, etc.). Why do you think is it an advantage for the milk snake to look like the coral snake? This is called mimicry. From your observations, what do you think this term means? 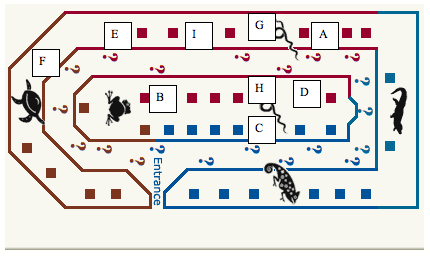 Map of the Reptile Discovery Center – Note: These locations are approximate! Here's a map of the Reptile Discovery Center. Please note that locations are approximate.